A second half penalty from Carlos Tevez plus Alvaro Morata's early tap-in secured Juventus a huge advantage over Real Madrid heading into the Champions League second leg. The home side kicked off under a spine-tingling atmosphere at the Juventus Stadium, as Italian masterminds Massimilano Allegri and Carlo Ancelotti's respective teams locked horns in what promised to be a scintillating Champions League semi final. Juventus were hungry for early success, and that exemplified when Tevez picked out the exemplified Vidal scorching into the area. The Chilean, though, took an unnecessary first touch; resulting in Casillas plunging down to retrieving possession. Moments later, the Spanish keeper had to get down low once more; stopping a powerful low strike from Stuaro just outside the area. Allegri's men already implemented a quick, fiery tempo. 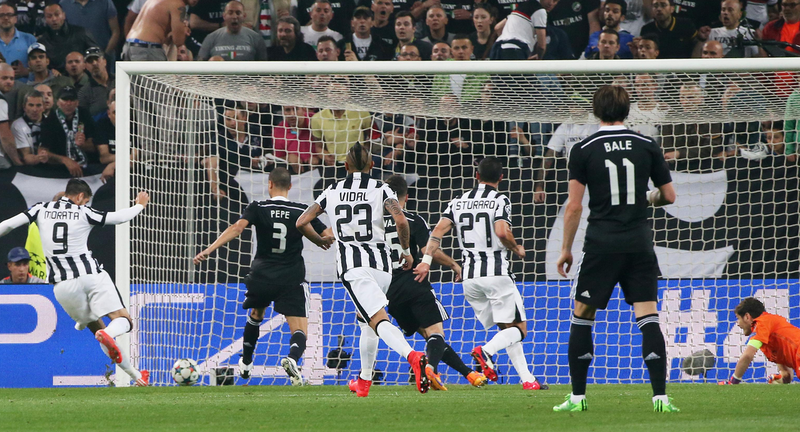 Bale earned a free-kick around 20 yards from goal, only for Ronaldo to plant his effort against the firm wall. Moments later, former Madrid striker Morata won a yard over his marker and audaciously chipped at goal. Luckily for Los Blancos, Casillas had it covered and saved comfortably. 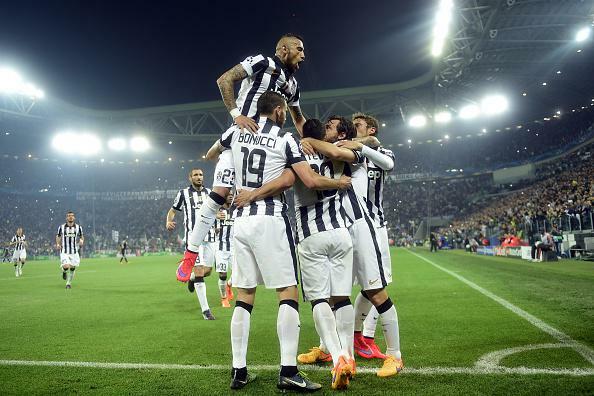 Juventus were terrific in the first eight minutes; creating fantastic build-up play and they got their reward. Tevez strode a few yards into the box, unleashed a grass-cutting strike which Casillas did well to palm away, but only to his right side. Found poaching at the back post was Morata, who simply converted from close range to give his side a crucial early lead. Juventus were frustrating Madrid early; with both Ronaldo and Bale being prevented from stretching their legs and testing the hosts down each flank. Tevez drilled a low shot at goal, which Casillas easily had covered. The-offside Stuaro would appear to his right, though and clip a poke against the post. Clear warning sign. Marcelo stabbed a wonderful pass down the wing to Ronaldo, who latched onto it immediately and blistered past Chiellini. When eventually approaching Buffon's goal, though, the Portuguese man frustrating scuffed his left-footed shot wide of the target. As 25 minutes quickly passed, Ronaldo increasingly became ambitious and continued to fall deeper seeking possession. Madrid were just beginning to press the home side and create more promising chances. To their satisfaction, a goal would eventually come out of it. Fantastic link up play would see Rodriguez, on the right, assist Carvajal who took the ball past one defender, chipped over the over one and found Ronaldo poaching. Before this chance, the Portugese man was level with Messi on Champions League all-time top scores. He soon headed his way to the top, beating Buffon who already committed himself to the ball earlier in the build up, to convert on the goal line. 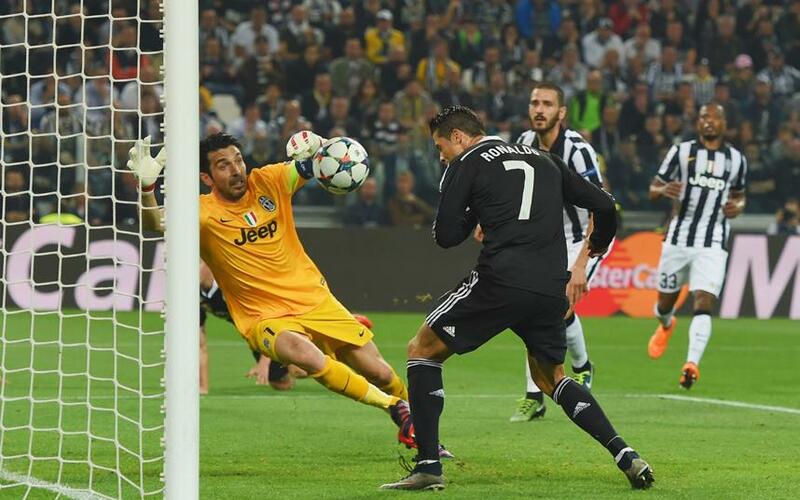 Madrid were the side piling the pressure on Juventus, and a sequence of more clever play almost crippled the hosts. Marcelo and Isco exchanged passes; resulting in the latter off-loading possession on the left byline. His cross would find Rodriguez goal-line, who briefly escaped his marker and lashed a header against the bar. Perhaps unlucky, but it was also a chance that should have been taken in a game of this magnitude. The half time whistle sounded, with Ronaldo's goal cancelling out Morata's opener. Juventus were pressing high up the pitch, clearly in need of a second goal if they stood a realistic chance of reaching the final. Santiago Bernabeu is such a hard place to visit so an aggregate lead heading into the second leg would have been beneficial. Tevez retrieved possession just past the halfway line and scampered goal-bound with not many Madrid defenders insight. Approaching the box, he took the ball down to the left byline until a clumsy challenge from Carvajal would change the landscape of the game. The Spaniard bundled Tevez over and conceded an unnecessary penalty. Up stepped Tevez himself, and a fantastically struck effort flew straight down the middle past the helpless Casillas who could only watch on. Advantage Juventus. Hernandez replaced Isco, while Barzagli was added to the hosts' defensive duties as the-impressive young talent Stuaro made way. The game tempo had calmed down with 15 minutes remaining, with Juventus clinging onto their lead but Madrid's regular pressure testing their concentration levels. Although the visitors were trailing, things didn't seem as bad considering a second leg at the Bernabeu was in store. Madrid are always strong there, and ultimately, they have an away goal. Carlo Ancelotti's decision to slot Ramos into midfield turned out to be a mistake. Constant inaccurate passes and sloppy play was costing Madrid during build-up play. Juventus had completely quietened down up top; with all the late possession occurring up in the home side's half. Despite Madrid's desperate attempts to grab a late equaliser, Allegri's men were compact and resolute at the back. A late chance would see Llorente's close range header pummel against Casillas and that would be the final one as the final whistle would blow with Juventus toppling Real Madrid 2-1, holding a crucial advantage heading into the second leg. Carlos Tevez and Alvaro Morata are on target to thwart Real Madrid in the first leg of Juventus' Champions League semi-final with the holders.